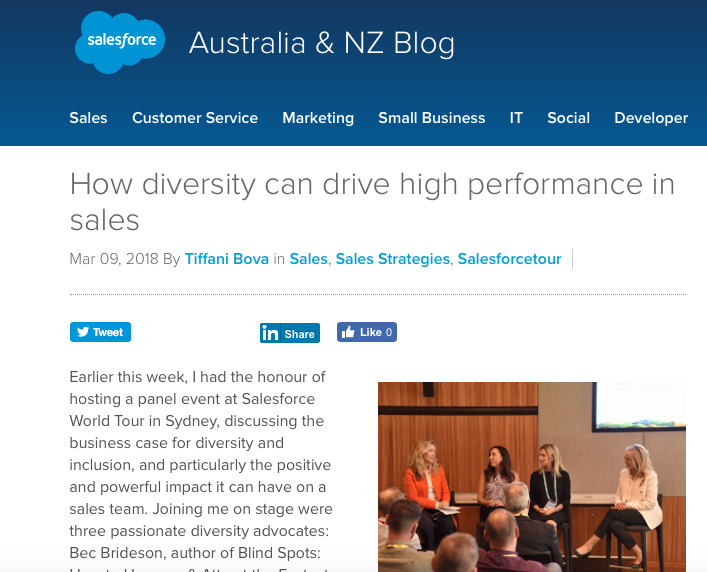 Earlier this week, I had the honour of hosting a panel event at Salesforce World Tour in Sydney, discussing the business case for diversity and inclusion, and particularly the positive and powerful impact it can have on a sales team. Joining me on stage were three passionate diversity advocates: Bec Brideson, author of Blind Spots: How to Uncover & Attract the Fastest Emerging Economy, Angela Theodore, National Manager of Customer Service at BlueScope; and Andrina Graham, Director and Co-Owner of Argyle Prestige Meats. With yesterday being International Women’s Day, it feels pertinent to reflect on some of the highlights of the session. Despite a mounting body of research showing that diverse teams outperform their competition across a broad spectrum of metrics, including profitability, innovation and productivity, workplace diversity appears to be the global warming of the business world. People seem hesitant to believe the evidence and instigate the change required to move the diversity dial. Inevitably it’s going to be the customer that forces change. Why? Because consumers have never been more informed or had more choice than what they do today. The internet has opened up a whole new world of buying opportunities, and customers want to buy from those who get them. If a sales team isn’t diversified, how can it represent or understand the diverse community it’s selling in? During the World Tour session, Brideson spoke about the growing importance of the female economy, who control $28 trillion of the $35 trillion global consumer economy. Yet gender blind spots along the sales pipeline are hindering businesses’ ability to leverage and enable buy-in from the relatively untapped, ignored and underserved female economy. “One of the most seismic shifts in the marketplace this century is going to be the realisation that women are highly valuable consumers who are in urgent want for better connection, and better designed products and services. This is a golden opportunity not to be missed,” she said. While Graham agreed that you need alignment between your workforce and customer base to ensure that your products talk to the customer who’s buying them. It’s incredibly important to keep talking about and advocating for gender diversity, particularly on days like International Women’s Day, and especially when the World Economic Forum reminds us that gender parity is 217 years away. But, we must not forget that true diversity, and the benefits that ensue, comes from more than just gender. It’s also diversity of age, race, culture, sexual orientation, religion and thought. Research has shown that all of these differences combined can produce powerfully diverse teams, who question and challenge one another, and collectively create better business outcomes. It’s dangerous for any organisation to be thinking they’ve ticked the diversity box if they have a 40% female board. It’s a start, but certainly not the finish line. Sales organisations prioritising diversity are realising the powerful impact a more diverse sales team can have on the bottomline. A broader range of mindsets and backgrounds leads to better thinking and innovation, along with an improved ability to overcome stale ways of working and truly connect with the customer. In today’s hyper-competitive environment, empathy-based selling has become critical to sales success. The ability to listen, connect and empathise with customers is a game changer – and a diverse sales force is better-placed to have empathy for its diverse customer base. At World Tour, Theodore shared Bluescope’s inspiring story, with the Australian global steel manufacturer making significant inroads towards achieving a more gender diverse workforce. Bluescope has introduced sweeping diversity and inclusion initiatives that specifically target recruitment, selection, flexible work practices and team culture. “If we want to be representative of our customer base and driving profitability for our business, we need a more balanced workforce,” said Theodore. “Gender diversity is a priority, because that’s where we have one of the largest gaps,” she said, highlighting that in 2016 only 16% of its workforce was made up of women. We all agreed, that an important first step in driving diversity is to take stock of your current workforce, and identify priority areas and gaps that need to be closed. Here at Salesforce, as part of our overall commitment to advancing equality for all, we’ve pledged to evaluate our workforce on an ongoing basis to ensure that employees performing similar work, at the same level, are paid consistently. Meanwhile, the real challenge in overcoming gender ‘blind spots’, according to Brideson, is empowering men and women to collectively think differently and look past gender stereotypes in order to uncover how to best serve the customer and hone the right sales message. And, again, this applies beyond gender. Sweeping biases often trap companies and halt diversity progress. Stereotypes and fallacies, such as millennials are the only generation good at using technology or older salespeople aren’t as effective in the modern marketplace, are just as harmful to diversity agendas, and they certainly aren’t going to advance equality.